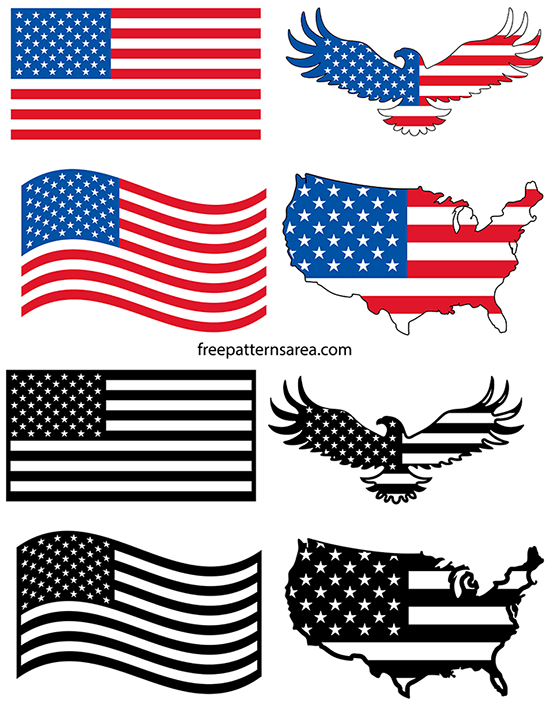 4 different types of American flags vector pictures comprised of American flag graphic images. 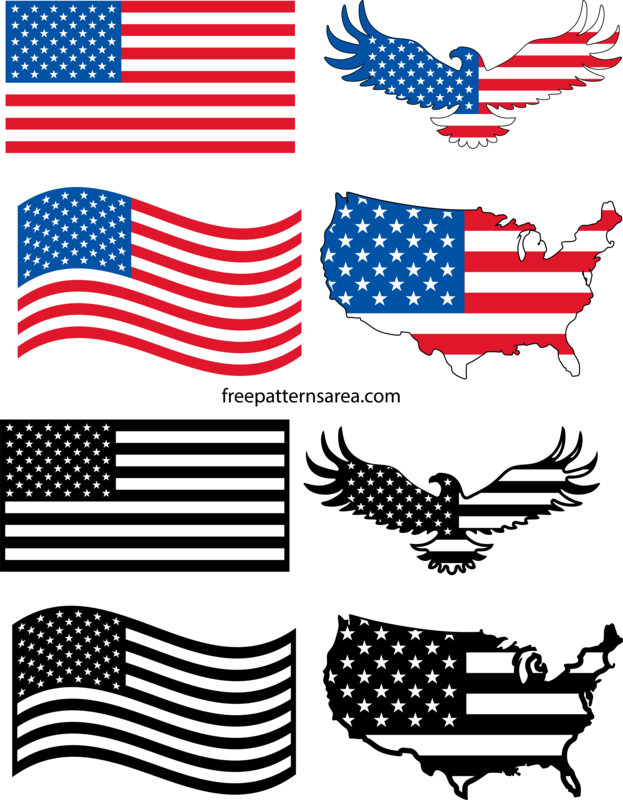 These vectors are original, waving, eagle, and map USA flag shaped illustrations. We have published the drawings on our page in colored and black and white American flag forms. We wanted to thank our American visitors who have been supporting us since the day we started publishing for this project. We have made 4 different USA flag drawings for them. 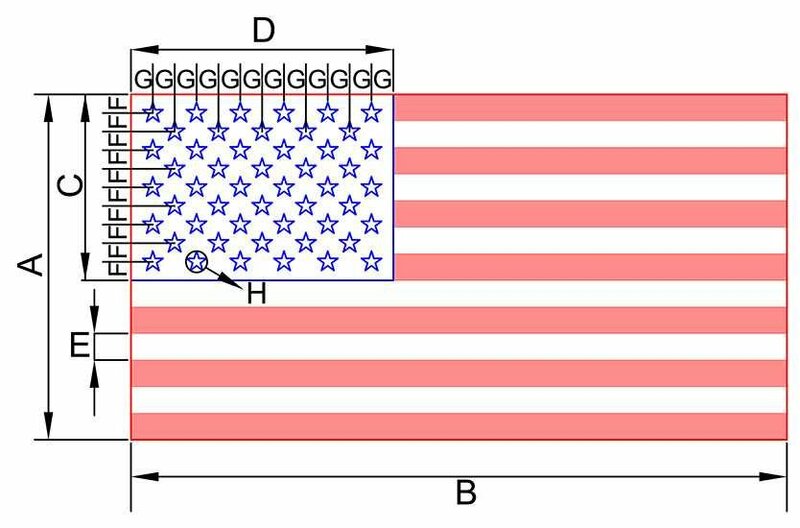 First, we prepared the original 50-star American flag vector by following the legally determined dimensions. Then we drew the American flag together with the bald eagle silhouette, which is the symbol of the United States of America. The third design of this project is the waving American flag drawing. In this drawing, we applied a wave effect to the standard US flag. In the final design, we combined the USA flag with the United States map silhouette. These drawings were then divided into two different concepts: colored American flags and black-and-white American flags. The colored concept is meant to meet your American flag graphic vector and American flag pictures needs. The black and white American flag concept is rather for cutting machines uses. We hope you like these American flag images. The American flag has evolved a lot until today. It took its final form in 4th of July, 1960 with the ultimate union of Alaska and Hawaii. The 13 horizontal stripes on the rectangular flag strata represent the 13 former British colonies that ensured the independence of the United States of America by joining the union first. Seven of these strips are red and the other six are white. The 50 stars in the nine rows on the flag represent the 50 states that constitute the United States. These fifty stars are in white color on blue background. The files of this design have been prepared in eight different formats. Designs are arranged in color, and black-and-white separately. 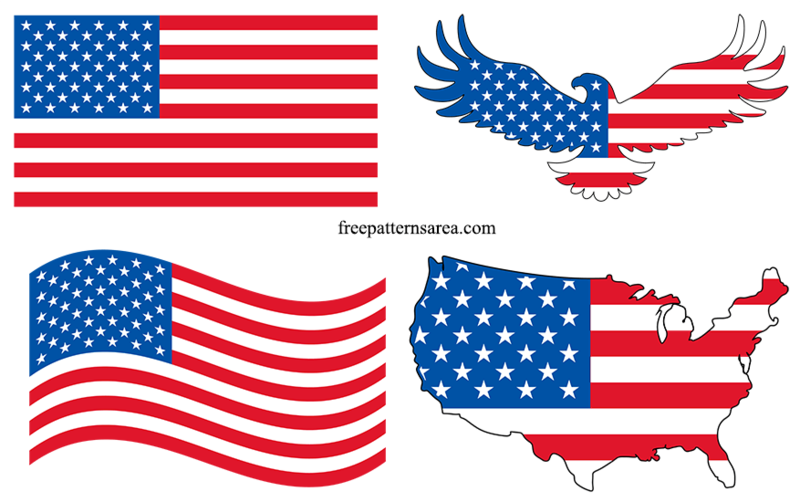 If you are looking for an American flag vector art file, you can download eps, png and svg files for free. You can scale eps and svg files to the size you want without any resolution loss. American flag is transparent, while HD png graphic file is in high resolution. The free svg file is prepared using a technique that also allows cut file usage. 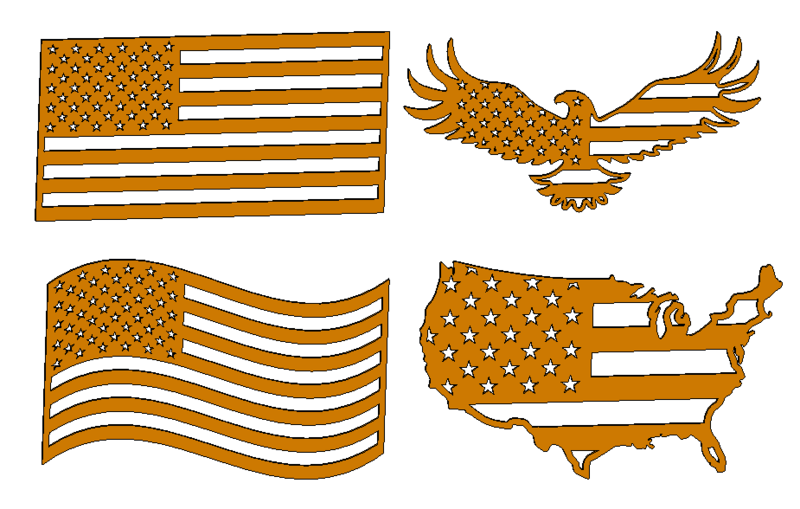 If you are looking for American flag cutting file for die cut machines like Cricut, Silhouette CAMEO, you can download svg and dxf files for free. 2D Dwg and dxf file formats are suitable for use in CAD programs. You can use these files in software like Autocad. 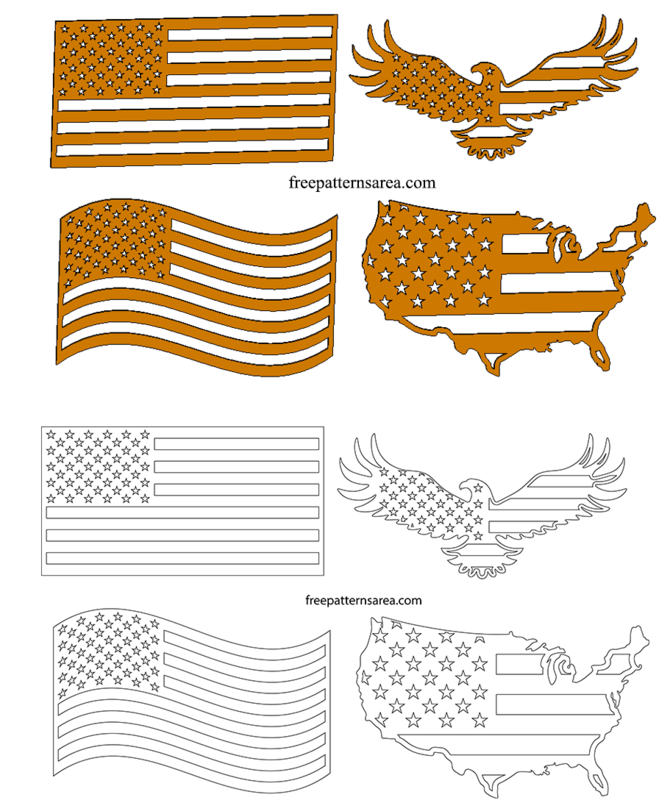 If you are looking for printable US flag template, you should download the PDF file. The PDF file is the file format with the outline drawing. You can download and use it either as a coloring page or a cut template. It is up to you. Wooden American flag ornaments template for craft. 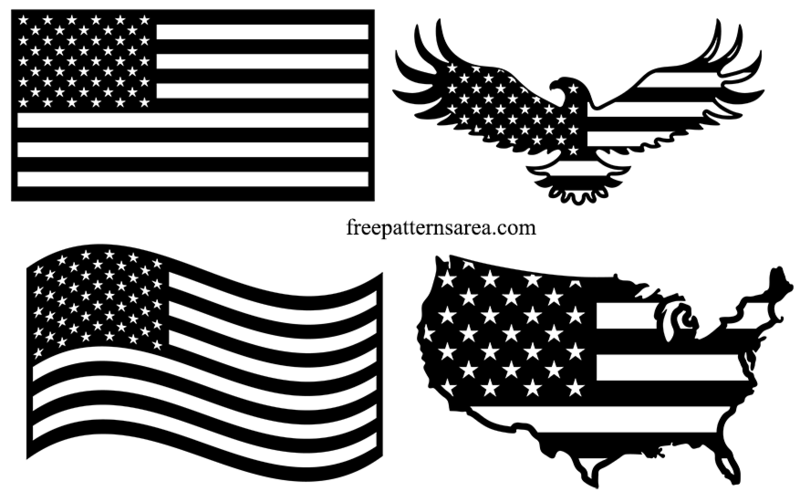 Download free usa flag vector images. Right click and save to free download • eps, • dxf, • svg, • pdf, • png, • dwg, • cdr, • stl files. This work is licensed under a Creative Commons Attribution 4.0 International License (CC BY-NC-SA 4.0).